Abbot Hall has a comprehensive collection of George Romney's work. His paintings are hung in the elegant historical settings for which they were painted, amongst fine 18th-century furniture and porcelain. Watercolours are shown in a small gallery reminiscent of a collector's private room, with regularly changing displays that allow a Turner to be seen alongside a Ruskin or a Constable sketch next to works by the likes of Cotman, Cozens and Edward Lear. Abbot Hall has been one of the most active galleries collecting British art in recent years and important works have been acquired, ranging from a Turner watercolour of Windermere to portraits by Stanley Spencer and abstract paintings by Bridget Riley and Sean Scully. 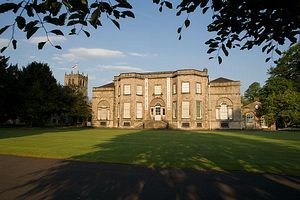 Abbot Hall has also secured some spectacular long-term loans, including works by Constable, L. S. Lowry and Lucian Freud. As well as a fine permanent collection, Abbot Hall is acknowledged as having one of the most imaginative and independently minded temporary exhibition programmes outside London. Picnic site nearby. Free admission to print exhibitions in Abbot Hall coffee shop. 10 minute drive from J36 of the M6, follow signs to south Kendal and then for Abbot Hall. Nearest main-line train station: Oxenholme, the Lake District.